The Oscars is upon us! In light of tonight’s event, here’s a list travel destinations inspired by oscar nominated movies. 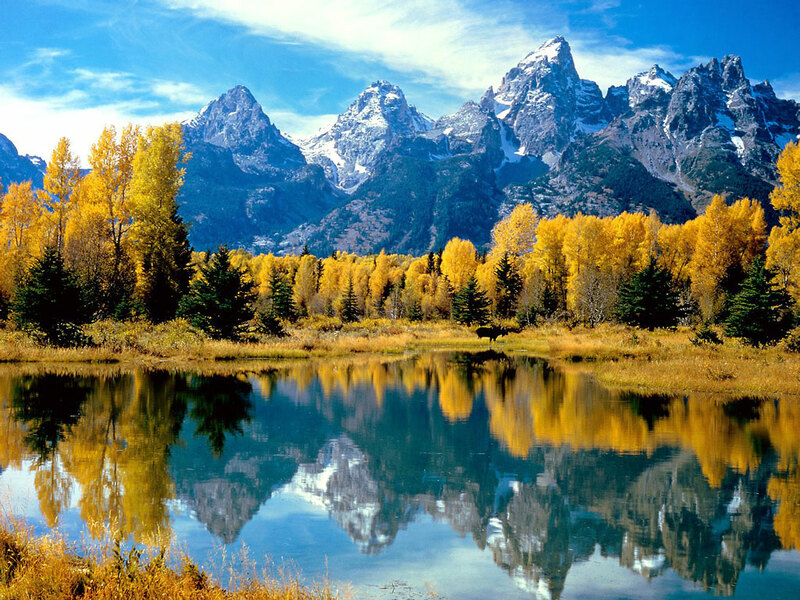 Wyoming, USA – Inspired by Brokeback Mountain, Wyoming seems like a beautiful state of untouched wilderness and sweeping mountain vistas. 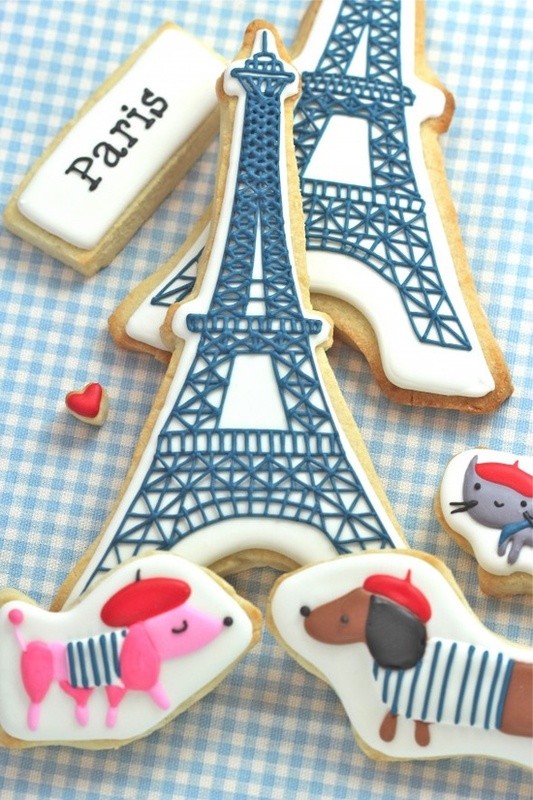 Paris, France – Inspired by Midnight in Paris. There’s no denying my love for Paris, but this movie made me want to seek out the old Paris of the roaring twenties. 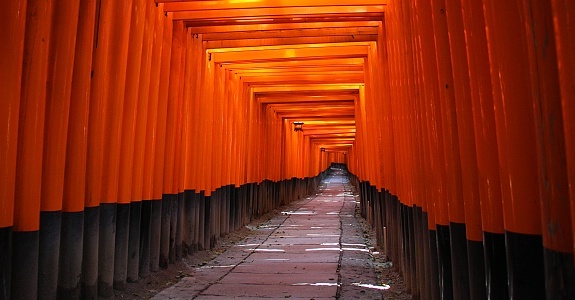 Kyoto, Japan – Inspired by Memoirs of a Geisha. The beautiful cinematography of this movie increased my desire to visit Japan, especially Kyoto, with it’s abundance of temples and shrines and women still dressed in traditional kimonos. Barcelona, Spain – Inspired by Vicky Christina Barcelona, I had already been to Barcelona by the time I watched this movie, but this movie definitely made me nostalgic for the amazing food and architecture of this vibrant city. Santa Ynez Valley, California, USA – Inspired by Sideways, who doesn’t want to visit this beautiful region with rolling hills, great wine, and food?! 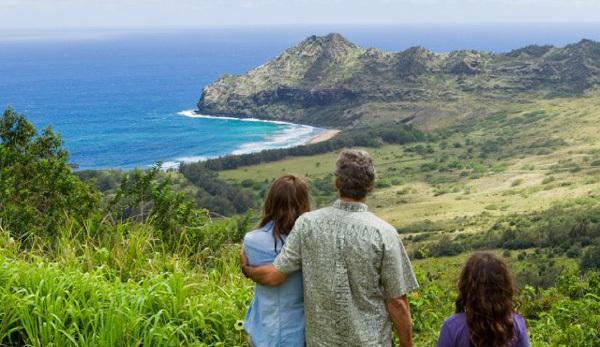 Hawaii, USA – Inspired by The Descendants, need I say more? I’m always up for visiting Hawaii again, but imagine actually living there? The great weather, beautiful beaches, and the laid back attitudes. 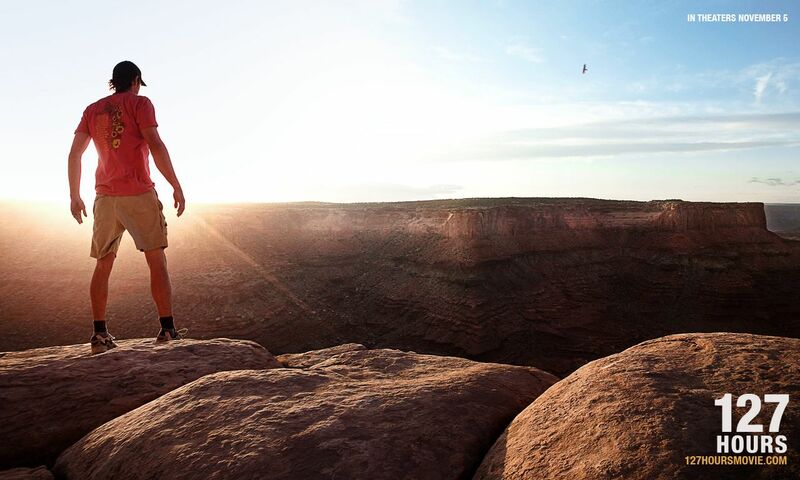 Utah, USA – Inspired by 127. Okay, so this movie freaked me out a bit, but being that I don’t climb, I’ll never hike by myself, and there’s cell phones now, I feel pretty secure in knowing that this won’t happen to me. 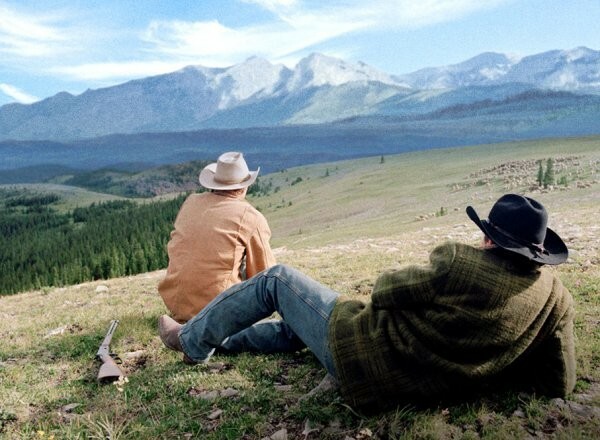 This movie did make want to visit Utah’s national parks though, which I’ve heard are amazing. New Zealand – Inspired by Lord of the Rings. Granted that many of the scenes are CGI, all of the filming was done in New Zealand and many of the sets are still there today. Check out the cute set of Hobbiton below! In addition to the cool sets you’ll get to see, New Zealand’s landscape is simply just stunning. Sign me up for a Lord of the Rings tour! 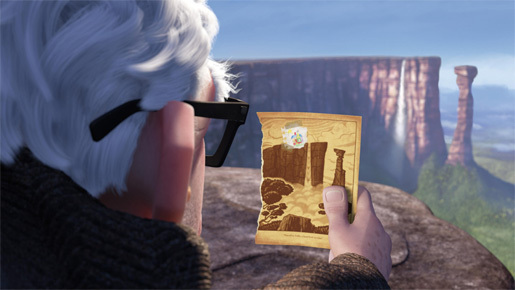 Angel Falls, Venezuela – Inspired by Up. 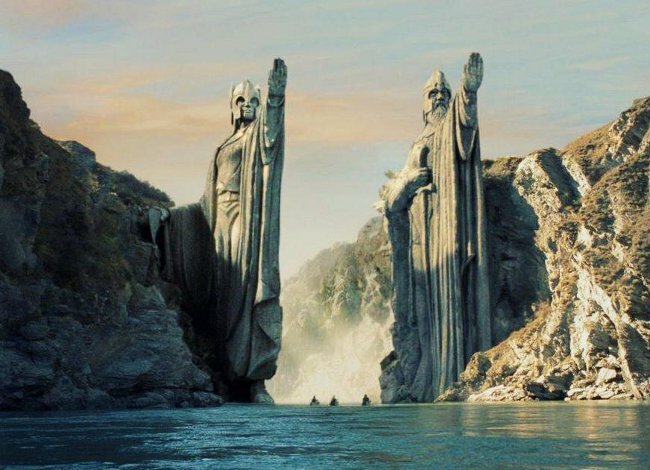 Okay, so I just love this movie, but besides that, who wouldn’t want to visit this spectacular waterfall. The tallest waterfall in the world and located in a remote area of Venezuela, it’s definitely a once in a lifetime type of trip. I wonder how many of these locations have seen an increase in tourism after the debut of these movies? What are some movie inspired destinations you’ve been wanting to visit? So I’ll conclude my french escape recaps with one last post on accommodations and general tips. First up is accommodations. The first 2 times I visited Paris, I stayed in hotels in the Montparnasse (14th arrondissement) and Montmartre (18th arrondissement) districts. Both are located a bit further from the centre of Paris but offer good deals. Montparnasse was famous in the early part of the 20th century as the heart of intellectual life. As such there’s many historic cafes and bars located there, famous for serving the likes of Ernest Hemingway and F. Scott Fitzgerald (sounds like “A Midnight in Paris”). That said, the area is less touristy than the other arrondissements, with some good neighborhood restaurants, however I found myself taking the metro quite a bit since it is far from most famous attractions. Montmartre is the bohemian enclave of Paris, made even more famous by the movies “Amelie” and “Moulin Rouge”. It’s where the Sacre-Coeur Basilica is located and is very quaint and picturesque. Similar to Montparnasse it is located far from most attractions. It’s a bit more touristy, especially the area around the Sacre-Coeur and is hilly, so can make coming home a bit of a chore after a long day. I didn’t spend much time eating in this area, however if you are here, one fun place I would recommend is Le Refuge des Fondues. For a set price, you get unlimited fondue with meat and bread and red wine served in a baby bottle. It’s definitely touristy, a little grungy, but way fun! 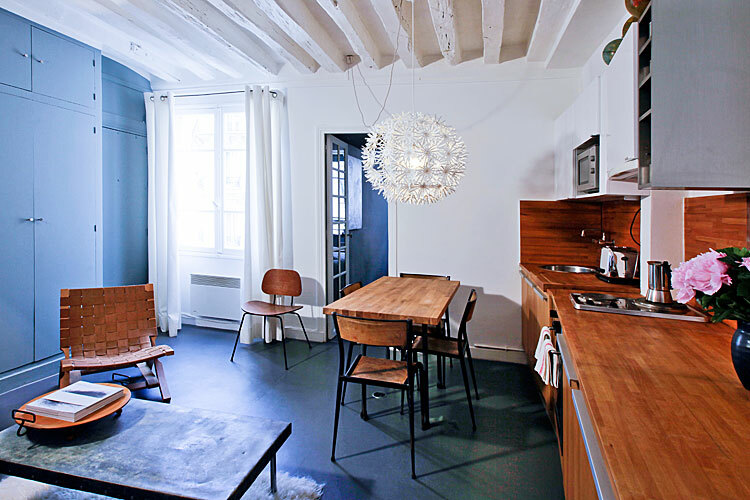 This recent trip, the hubs and I opted to rent an apartment in the Marais (4th arrondissement) district. First off, I looved this neighborhood. 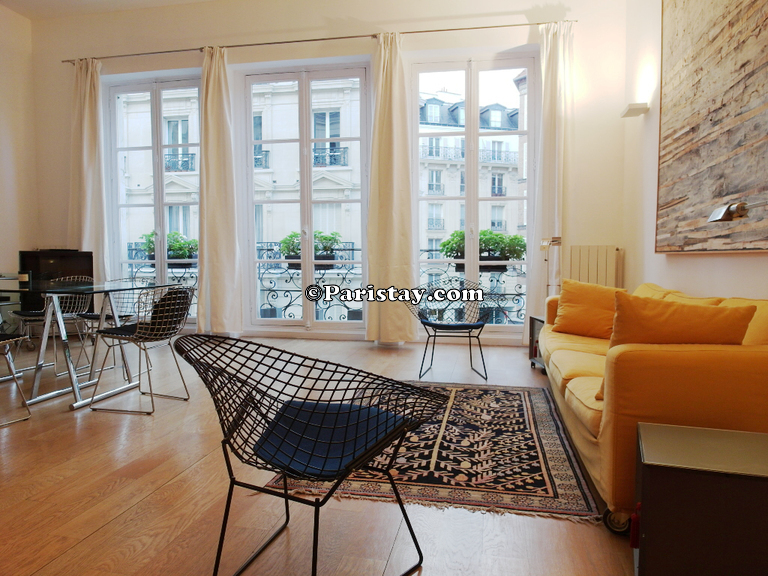 It’s walking distance to the Seine and therefore close to most sights, making it a very convenient home base. This lively and charming district is also full of great restaurants, shopping, and parks. Secondly, I would highly recommend renting an apartment. Oftentimes it’s cheaper than a hotel, you end up staying in more desirable neighborhoods, and you really get to experience what it’s like to be a Parisian. I’ve rented apartments in Madrid, Barcelona, Buenas Aires, Vancouver and now Paris, and I’ve had great experiences in each city. 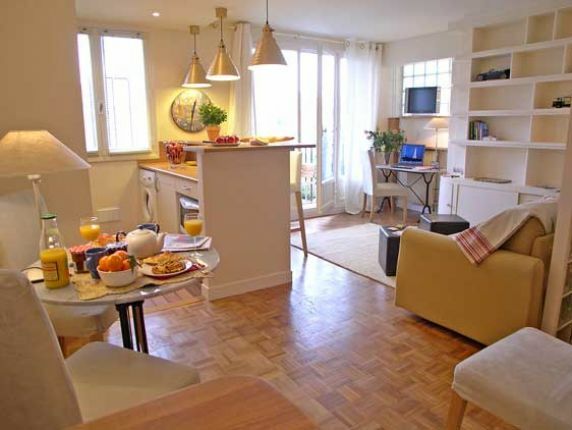 Check out some these Parisian apartments! And for those who want a little more luxury or need a bigger apartment. Check out this 2 bedroom. Imagine having breakfast or midday wine and cheese on that rooftop terrace?! 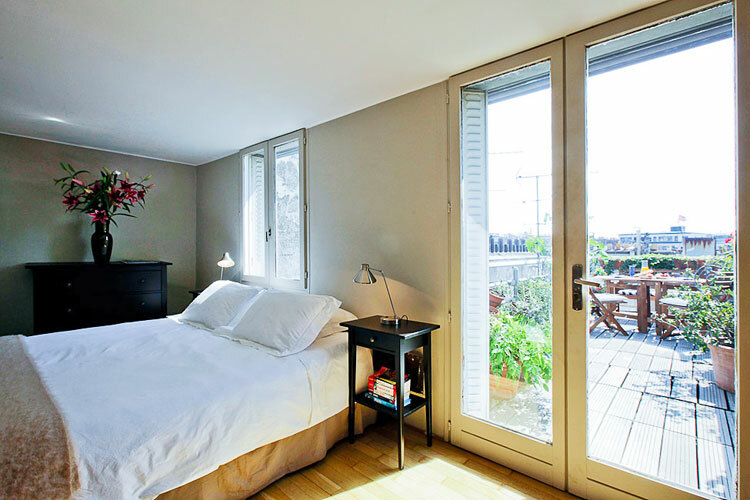 In terms of where to stay, my picks would be either Le Marais (4th arr. ), the Latin Quarter (5th arr. ), or St. Germain des Pres (6th arr.) because they are all centrally located, great walking neighborhoods, and full of restaurants and shops. The Eiffel Tower (7th arr.) area is also really nice however a bit of a trek from the city centre so you’ll have to hop on the Metro quite a bit. Research what sights you have to see, no more than 1-2 per day so you leave plenty of time for enjoying meals and wandering around. Make note of the opening hours (many museums are closed on Mondays or Tuesdays) so you won’t be disappointed. Research restaurants. Paris has an abundance of really great restaurants and also really mediocre overpriced restaurants aimed at tourists. Doing a little bit of research ahead of time can really make your experience that much more enjoyable if you’re not wandering around trying to find a decent place to eat. Also make note of opening hours, I found many of the restaurants I wanted to go to were closed on the weekends. Make reservations! Most restaurants are small and may not be able to accommodate you without a reservation. You only need to call 1-2 weeks in advance, but at least it’ll guarantee you a table. Try to group your activities and meals in the same arrondissements so you’re not criss crossing all over the city. Make time for a picnic. 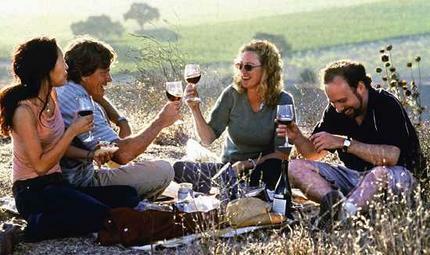 Buy some wine, fresh bread, cheese and salami, head to a pretty park for a picnic and enjoy the people watching. When booking train tickets, buy as early as possible for the cheapest rates. Learn a few french phrases. The french are much nicer when you start off with a “Bonjour, parlez-vous francais?” than if you just start talking to them in English. Think of how you would feel if a tourist came to your country and just started talking to you in their language? So this is the end of my recaps! I hope this was helpful to many of you in planning your own trips and help inspire others to visit Paris. I know I can’t wait to go back there again! I’ve been wanting to visit Mont Saint-Michel ever since I saw pictures of it. I mean, look at the picture above, it looks like it would only exist in a fantasy movie. Actually, the hubs claims it looks like a set out of the Lord of the Rings trilogy! So with 5 days in Paris, I knew we had to spend one day visiting Mont Saint Michel. 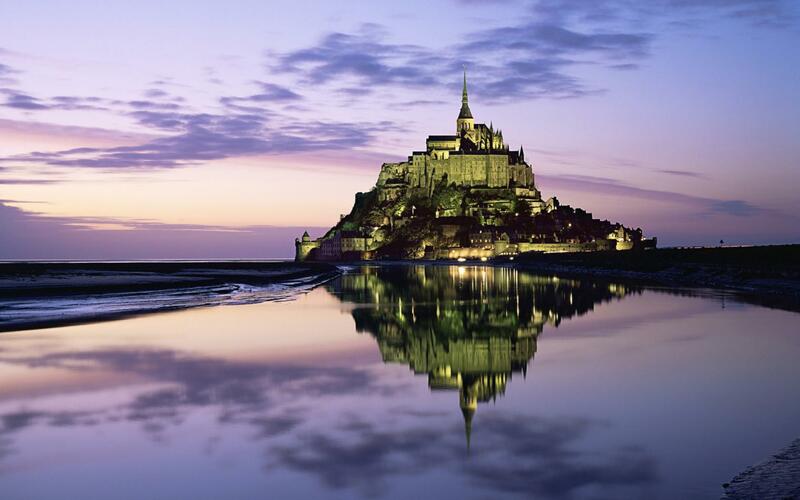 There are numerous companies that plan day trips from Paris and some of them even combine Mont St. Michel with other tourist destinations like the Normandy beaches and the Brittany coast. Most of the tours I looked into were reviewed favorably, span approx. 15 hours, typically making pit stops for lunch, with 3 hours of free time at Mont St. Michel and cost at a minimum $200 per person. You can do it yourself however, which is what we opted for since we liked being in charge of our own schedule. If you plan to see Mont St. Michel on your own, just know that it takes a little bit of advanced planning and the day can be tiring since there’s quite a bit of transfers involved. It does however give you the flexibility of going at your own pace and is certainly cheaper than booking a tour. Take the TGV from Gare Montparnasse in Paris to either Dol or Rennes. We chose Rennes because the timing was better for us and Rennes is a much bigger city than Dol and we figured we’d spend a few hours checking out the city prior to coming back to Paris. The train prices will vary depending on when you purchase, generally the earlier you buy the tickets, the cheaper they will be. We ended up paying approx. 86 Euros each for round trip tickets but easily could have paid less had we purchased it earlier. Total train time is approx. 2 hours and 15 minutes. Once you arrive in Dol or Rennes, you board a bus that will take you directly to the entrance of Mont St. Michel (the bus schedule corresponds with the train schedule so you won’t have to worry about getting the timing right). The bus is located right outside the train station and you can purchase tickets as you board. The bus ticket from Rennes to Mont St. Michel is 12.40 Euros each way and takes approx. 1.5 hours. Make sure to pick up the bus schedule so you know the departure times for the bus going back to Rennes. Overall, it took us approx. 4.5 hours to get to Mont St. Michel. We ended up spending 1.5 hours walking around the abbey and another 1 hour eating lunch and checking out the city. The city itself is pretty since it’s a cobblestone medieval village at the base of the abbey, however aside from being very picturesque, we didn’t feel the city had much else to offer. It’s rather touristy and is mostly full of souvenir shops and restaurants. One reason why we decided to DIY the trip is that most of the tours allot only 3 hours of free time to visit the abbey and the city which I wasn’t sure was sufficient, however it’s actually more than enough. In fact, we ended up taking an earlier bus back to Rennes, giving us more than 5 hours in Rennes before taking the train back to Paris, which was another problem since we also felt that was too much time in Rennes. In summary, I would say visiting Mont St. Michel is a must for any tourist. If I were to do it again, I’d highly consider doing a tour and combining it with a visit to the Normandy beaches. While the tour is more expensive, it involves less transfers and seems a more comfortable and enjoyable way of doing the trip. 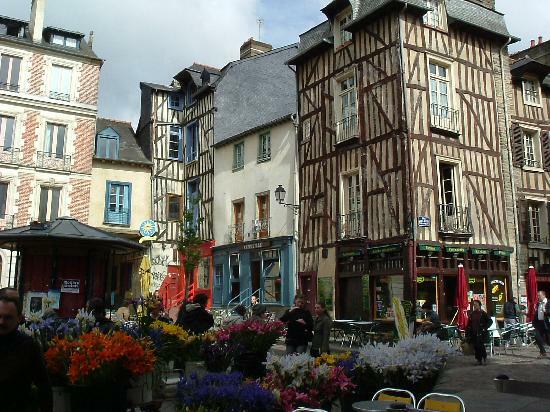 I would recommend the DIY route if you’re looking to control your own schedule, are on a budget, and want to spend time in Rennes or Dol in addition to Mont St. Michel. One thing to keep in mind though is you do buy your train ticket in advance and your departure times are set so you won’t be able to hop on an earlier train if you’re done sightseeing unless you buy a refundable ticket which costs more. Also, don’t let me deter you from visiting Rennes. The city is worth visiting and has a wonderfully preserved city centre, full of medieval buildings. There’s plenty of shops and restaurants in the city centre and parks scattered throughout the city. The hubs and I just felt that 2-3 hours were enough for us and given that we already had a long day, we were ready to get back to Paris.